Looking for timely, relevant info that'll help you enjoy and succeed with succulents? Join the growing community of more than 11,500 subscribers who get my bi-weekly newsletter! Below are succulent basics, must-do's and answers to FAQs - the essentials for growing succulents successfully. Just click on a topic to jump straight to the content you're looking for. If all this is new to you, you'll want to refer to this page often. And even if you're experienced with succulents, you'll find it an ongoing resource. A succulent is any plant that stores moisture in fleshy leaves or stems in order to survive periods of drought. Or, as Jeff Moore says, "Any plant that when stepped on leaves a wet spot." Aloe vera, shown here, is one of the juiciest. Note its gel-filled leaves. Find detailed info as well as how to design with and care for specific succulents in my books, which are about using succulents to enhance gardens, landscapes and containers. How much water is ideal? Aim to keep soil about as moist as a wrung-out sponge. About once a week should do it. Water thoroughly to soak the roots and flush salts. For succulents in containers, that means until water drips out the bottom of the pot. Water more during hot, dry spells and less or not at all during periods of high humidity, cool temperatures and rain. Also, the fatter the succulent or the fleshier its leaves, the more water it stores in its tissues and the less water it needs (and will tolerate). Cacti in general are less tolerant of overwatering than smooth-leaved succulents. What if I've overwatered my succulent? Let the soil dry out (or nearly so). 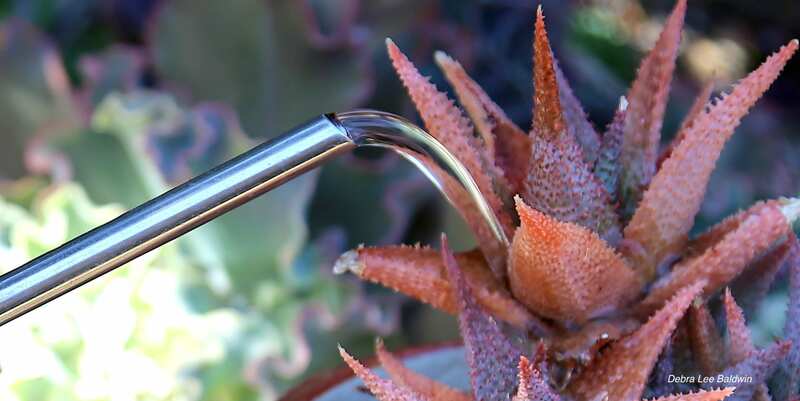 An occasional overwatering won’t harm most succulents providing the soil is fast-draining. If water has collected in a pot saucer, remove it so roots don’t sit in water. How can succulents live in terrariums? Don’t they need good drainage to survive? They’ll be fine if they’re not overwatered. It’s not drainage that’s important so much as avoiding root rot, which succulents are prone to if they sit in water. When given less water than is optimal, they draw on moisture stored in their leaves (which is the very definition of a succulent). I water my terrarium succulents by inserting a medicine dropper full of water at the base of each plant. As soon as I see through the glass at the bottom that the sand is wet, I stop. Underwatered succulents tend to grow very little, which is a good thing because they don’t outgrow the container. You could never do this with most other plants, which, when given too little water, dry out and die. How do I protect my succulents from too much rain? Move potted succulents beneath your home’s eaves. Place patio umbrellas (with concrete bases for stability) in the garden to keep rain from soaking your in-ground succulents. Channel runoff away from garden beds. Move and replant succulents in low-lying areas where water puddles. Topdress the soil around the plants with several inches of pumice to absorb excess moisture. What potting soil do you recommend? The easiest is to simply buy bagged “cactus mix” at any nursery. A more economical way to go is to get any inexpensive, general-purpose potting soil (the brand doesn’t matter) and mix it half-and-half with pumice. Add more pumice for cactus, less for fine-leaved succulents. If you can’t find pumice, perlite will do. Read more about why pumice is important. What do you mean by fast-draining soil? It’s coarse and crumbly, as opposed to sandy or claylike. Water flows through it quickly, and it has lots of tiny air pockets. Roots that sit in mud will drown. Watch on my YouTube channel: Soil Mix for Succulents (2:49). How much sun exposure do succulents need? It depends on the climate, locale, and type of plant. Along the coast of California, from the Bay Area south, most succulents are fine out in the open year-round. Inland, it's a different story; most succulents will need some sun protection in summer especially in the afternoon. But often all that is needed is the right microclimate, such as a lacy tree canopy. Incidentally, even in their native habitats, young cacti won't tolerate open exposure. They grow in the shade of nurse plants until they're large enough to handle the rigors of the desert. What's the ideal light for succulents, indoors or out? Actively growing succulents do best with full spectrum light that is bright and diffused—beneath shade cloth outdoors or (if in a greenhouse) translucent white plastic. (Optimal light is when shadows are fuzzy, not sharp.) Dormant succulents don’t need a full spectrum light source (fluorescent is fine if you’re overwintering them indoors). Why are my succulents leaning? Your Agave attenuata are healthy but searching for sunlight. Rotate the containers 180 degrees weekly for even sun exposure. Why is frost bad for succulents? Moisture in the cells of a "frost tender" plant expands when it freezes, cell wall burst, and the tissue turns to mush. How can I keep frost tender succulents alive in winter? It depends on how cold it gets where you live, and whether they're in pots or in the ground. In areas where temperatures drop below freezing, move your potted succulents indoors. Give them bright light for six hours a day and good air circulation. Most kinds go dormant in winter, so they don't need much water. Enough to moisten the soil occasionally is fine. In-ground succulents will need to be covered with frost cloth or sheets when temperatures drop to freezing (32 degrees F), unless they're frost-tolerant. Which succulents can grow outdoors in winter where it's cold? Succulents that can handle temperatures well below freezing for extended periods include fine-leaved sedums (stonecrops), sempervivums (hens-and-chicks), most ice plants and yuccas, and a few kinds of agaves and cacti. If you live in a cold climate, I recommend the book "Hardy Succulents" by Gwen Kelaidis. Incidentally, the majority of succulents can handle temperatures below 32 degrees for short periods (an hour or two), but may show some damage on leaf margins and tips. And even if the plant freezes, it may return from the roots in the spring. Can I grow succulents in Northeast successfully? I will be using a container to grow them. Absolutely! Growing succulents in challenging climates is why I wrote "Succulent Container Gardens." Anyone, anywhere can grow succulents in containers, which are portable and can be moved and sheltered when the weather turns too cold, wet, humid or hot. See Chapter 5 of my book, Designing with Succulents (pp 119-131), "Growing Succulents in Colder Climates." Want ideas for your desert Southwest garden? Visit my Pinterest page, Cactus Chic. What's the easiest succulent to grow? Probably jade plant, unless it's exposed to frost. Which succulents are relatively fast growing; easy to propagate from cuttings, leaves or offsets; and are immune to weather extremes? I would like to propagate a variety of succulents here at my nursery in northern South Africa. However, considering inland temperatures range from 30 degrees in winter to 110 in summer, I'm unsure which species and cultivars will survive. Your climate sounds like mine, and I grow nearly everything in my books. Most senecios, agaves and aloes do fine out in the open, but echeverias, aeoniums, kalanchoes, crassulas, sempervivums and fine-leaved sedums need protection from frost in winter and scorching sun in summer. Grow them beneath latticework or lacy trees, or perhaps in an open-air greenhouse with a shadecloth roof. Protect the plants from rainfall in excess of 20 inches/year lest the roots rot. Most commercial growers apply a balanced liquid fertilizer whenever the plants are watered during the growing season (generally spring and summer)---once a week, half strength. You'll find succulents among the easiest plants to propagate by pups, offsets or stem cuttings. When leaves get brown and dry under the main head, is that normal, or is it lack of water, or perhaps seasonal? Should I clean them up or leave them on? It's normal. You can do either, the plant doesn't care, although dry leaves do offer greater protection from sunburn and climactic extremes (if those are issues). Do succulents need to be cut back and replanted? Echeverias, aeoniums and most rosette succulents form new leaves from the center of the rosette, and older leaves dry and fall off, exposing an ever-lengthening stem. So, yes, they'll need to be cut back if you want to keep the planting dense and low to the ground. The tighter you want a composition, whether garden bed, wreath or container, the quicker you'll have to cut it back due to plant growth. And don't fertilize. If they're not fed, they tend not to grow too rapidly. How can I make these plants, such as echeverias, aeoniums, grow really big and showy? When it comes to growing large, dramatic, picture-perfect echeverias and other rosette succulents, the best way to do it is to observe their growing conditions in the nursery where they came from. Generally, you'll see that they're in pots, not in the ground, and protected from harsh sun and extremes of heat and cold. They're in a coarse, fast-draining potting mix and receive small doses of a balanced fertilizer during their growth season (spring for echeverias, winter for aeoniums). They get good air circulation to discourage pests. Perhaps most importantly, they grow in bright, diffused light, beneath shade cloth or (if in a greenhouse) translucent white plastic. For what needs doing and when in your succulent garden, see Succulents Simplified, pp 74-75: "Seasonal Care for Succulents." When, how much, and what kind of fertilizer should I use? Apply small doses of a balanced liquid fertilizer during the plants' growth season, which for most succulents is spring. Which are the best succulents to grow indoors? Most succulents are sun-lovers, but a few highly desirable ones actually prefer low-light conditions. Among them are haworthias and sansevierias, of which there are dozens of varieties. Some of my favorites are fairy washboard (Haworthia limifolia) and zebra plants (Haworthia attenuata cultivars), and "bird's nest" sansevierias, which are more compact than taller, better-known snake plants. So-called "walking sansevierias" are cool, too; they send forth horizontal offsets (miniatures of the mother plant) that produce chubby aerial roots in hopes of finding soil in which to establish themselves. Tropical succulents such as Rhipsalis species, being understory plants, do well indoors; grow them in hanging baskets or in pots that allow them to cascade, ideally in a bathroom or kitchen where they'll benefit from extra humidity. Also, many succulents that are variegated (striped or mottled with white or shades of yellow) that may sunburn due to lack of protective pigment will work as house plants. What do indoor succulents need in order to thrive? Rotate pots weekly for even light exposure, lest plants grow (and stretch) in one direction. Indoor succulents---indeed, all indoor plants---need good air circulation to keep pests such as mealy bugs from settling in. I want to incorporate succulents into a fairy garden. Any tips? Keep scale and proportion in mind. There are numerous small succulents that suggest much larger varieties, trees and shrubs. One of my favorites for fairly gardens is Crassula tetragona, which looks like a miniature pine tree. There are many how-to videos on my YouTube channel. Plant Stacked Crassulas in Stacked Pots (3:12). Are succulents compatible with roses? Yes, but not cacti, which won't tolerate the extra water that roses require. Don't plant the succulents right at the base of the rosebushes. Create basins around the shrubs to hold water, fertilizer, compost and mulch. Keep in mind that many succulents (such as columnar euphorbias) may look odd juxtaposed with rosebushes. But rosette succulents (such as echeverias, graptoverias, aeoniums and graptopetalums) look fine with roses, in the garden or in bouquets. Why do my indoor succulents get mealy bugs but the ones outdoors don't? Good air circulation keeps pests from settling in. Do you have a safe way to rid succulents of ants? Remove any leaves that come off easily, blast the plant with a hose to dislodge pests (especially in leaf axils), then spray the leaf axils with Isopropyl alcohol. Petra Crist (Rare Succulents nursery in Bonsall) uses Windex. Create a barrier around the trunk of the plant that ants won't cross and make sure there are no access routes to it from other plants. I found mealy bugs on some of the succulents we brought into the greenhouse for the winter. What is the best way to treat this pest to keep it from spreading to all the plants? Isolate the affected plants immediately before it spreads. Spray the plants with isopropyl (rubbing) alcohol diluted 50% with water. Place in a dry, well-ventilated area that gets several hours of sun a day (but not too close to window glass lest U-V rays scorch the leaves). If no mealies show up on the plants in six weeks, they're probably OK, but I still wouldn't put them near any others. Are there bunny- and deer-resistant succulents? Bunnies and deer tend to avoid succulents with sticky, milky sap (euphorbias). But they'll eat anything if hungry enough. Your question reminds me of an exchange I had several years ago with a succulent aficionado who lives in the hills of Pasadena. Deer, who frequented a trail alongside her garden, were driving her crazy. She had tried repellants, motion-activated sprinklers, shrouding plants with chicken wire, barricades---nothing worked. Deer invaded and ate the garden between midnight and dawn. We discussed pellet guns (not legal in Pasadena) and a sling shot (her aim wasn't good, and besides, she'd rather sleep). Finally, she installed a seven-foot fence. Presto: A perfect garden and peace of mind. Needless to say, I wish there were a better alternative! For pest and disease identification and control, see Succulents Simplified, pp 76-77: "What's Wrong with Your Succulent?" Are your agaves rotting where their leaves are attached? See my video: Agave Snout Weevil Prevention and Treatment (6:43). Can you tell me why my succulent has brown patches on its leaves, and what to do about it? Looks like the plant was kept in low light for an extended period, which made the leaves flatten to expose more of their surface area to available light. Then it was placed in a sunny area which burned the leaves because they didn't have enough pigment to protect them. And then it was placed back in low light, hence the pale new leaves. Give your Echeveria agavoides as close to ideal conditions as you can (bright shade, gradually leading up to full sun for half a day), and eventually the sunburned leaves will be concealed by new growth that emerges from the center of the rosette. My echeveria was overwatered and now the lower part of the stem is soft. Can it be salvaged? Cut the stem where it's still healthy and set the cutting aside for a couple of days to let the raw end heal. Insert the stem into fresh soil but don't water it for several weeks. Help! I thought I was spraying ant spray on my month-old succulent garden, but it was Round-Up Weed and Grass Killer!!! I am going to try to clean off plants with water today but is it too late to save my garden? After hosing off the leaves, wait a few days, then tug on the plants gently to see if they're rooted. If they are, all is well. But if Round-Up has killed the plants' roots, they no longer can hydrate their leaves to protect themselves from sunburn. Get shade cloth from a home improvement center (they sell it by the yard in the gardening dept) and drape it over the plants. Ideally elevate the shade cloth to allow air circulation---vertical sticks and clothespins should do it. But you can also simply lay the shade cloth atop the plants, if need be. There's a chance, when the weather cools, they'll grow new roots. They may show some tissue damage, but Round-Up doesn't stay in the ground, so the roots should be OK. Also go to the Round-Up website (look on the label) and check the FAQs. Doubtless you're not the only one who has made this mistake. Good luck! Where can I obtain seeds to grow succulents? Check out the CSSA Seed Depot online. I don't have a succulent nursery near me. Where can I buy the plants? Check the garden centers of Lowe's and Home Depot. See my post: Where and How to Order Succulents Online. For sempervivums, haworthias and other cold-climate or indoor succulents: Mountain Crest Gardens. Can You ID My Succulent? The volume of email I receive makes this difficult. The good news is I'm working on a website page for each genus. For example, my Aloe identification page has 70+ labeled photos of various species and cultivars in bloom. Moreover, the hundreds of succulents shown in my books are ID'd in the captions. There's a lot of inaccurate info about succulents online, but I've found that San Marcos Growers has dependable IDs and info. Companion plants (those with similar cultivation requirements as succulents) have an entire chapter in Designing with Succulents. Learn about exceptional public and private succulent gardens, what's trending in container garden design, my own gardening experiences, and interviews with succulent experts and designers in succulent articles here on my website and the blog I share with Fran Sorin and Saxon Holt, Gardening Gone Wild. Subscribe to my newsletter, "like" my Facebook pages (Debra Lee Baldwin author and Succulent Container Gardens), follow me on Instagram (@debralbaldwin) and visit my YouTube channel. In San Diego or planning a visit? See my list of San Diego succulent destinations and nurseries. For specific advice regarding succulents that thrive in your area and how to care for them, contact your local chapter of the Cactus & Succulent Society of America. Join more than 11,500 succulent fans who get my bi-weekly email newsletter delivered to their inbox. Tips, varieties, how-to's, design projects, gift ideas, and so much more!